Another great news from the cinema world! 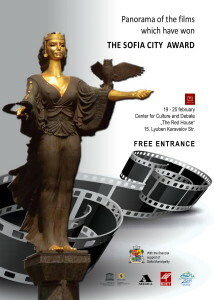 From 19th till 25th February we will have the wonderful opportunity to enjoy the a colorful panorama оf the films honored with the Sofia City Award. Production company Adela Media, with the financial support from Sofia municipality and the media partnership of BNT, is organizing Panorama of the films honored with the Sofia City Award. The screenings of all the 15 movies which were awarded from 2002 till today will make these incredible films accessible to a wide audience and the society. In this way an extremely important event will be promoted as the annual award of the Sofia City Award for brilliant achievements in the field of cinema art. Except the high artistic qualities and cultural message, the honored movies are also bringing to the attention of the audience the social problems and processes, which urged the authors to create them. At the same time, these movies are a kind of reflection of the dynamic and complicated period of our latest history, between 2000 and 2017. The panorama is an attempt for a different view on the things happening in Bulgaria – not through the facts, statistics or news emissions, but through the eyes of the artists. After the screenings, in a discussion with famous cinema critics, the public will have the opportunity to share their impressions and to meet the authors of the films. 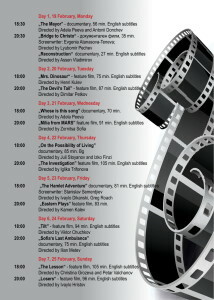 The movies will be screened from 19th till 25th February at The Red House Centre for Culture and Debate. Free entrance. From Small Steps to Big Changes – a training course in Antwerp, Belgium 12-18 April 2018 Become part of SOS Children’s Villages Hungary!